MELBOURNE, Feb. 12, 2019 /CNW/ - OceanaGold Corporation (TSX: OGC / ASX: OGC) (the "Company") is pleased to announce the continuing intersection of high-grade gold mineralisation during resource definition drilling along the East Graben vein at the Company's WKP prospect in New Zealand. These drill results support the high-grade results reported in 2018 and will enable geological modelling and resource estimation to define a maiden resource later in the year. Mick Wilkes, President & CEO of OceanaGold said, "We are very excited about the potential at WKP. Drilling continues to yield high-grade intercepts across multiple veins with each hole increasing our confidence of a potential resource and possible new major discovery located close to the Waihi operation. Discoveries such as these have the potential to further create employment opportunities while delivering socio-economic benefits to local communities and nationally." "For 2019, we expected to invest between $8 million and $10 million to drill the WKP target. Our current focus continues to be the East Graben vein which has not yet been fully delineated but currently extends 1,000 metres along strike with an average width of 5 metres and an average grade of approximately 15 grams per tonne. Two other high-grade veins have been identified in the footwall and hangingwall of the main East Graben vein. We also plan to further drill the T-Stream and Western veins this year with a goal of expanding the size of these veins." The Company commenced exploration of the WKP prospect in August 2017 and to date has drilled 15,747 metres in 29 holes. Since the September 2018 exploration update 5,361 metres have been drilled at WKP focussing on resource definition drilling of the East Graben Vein; one of three major low sulphidation epithermal gold-silver veins identified to date within the WKP prospect area (Figure 1). In addition to these known veins, the Company has intercepted several high-grade veins in the hangingwall and footwall of the East Graben Vein (Table 1). The resource definition drilling completed since the September 2018 exploration update has continued to successfully intersect high-grade mineralisation, increasing the confidence in continuity of mineralisation within the East Graben Vein and associated hanging and footwall veins. 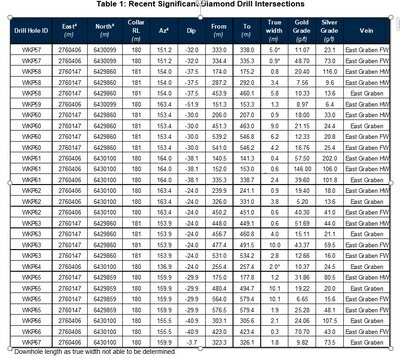 The drilling has returned best true width intercepts of 10.1m @ 19.2 g/t gold on the East Graben Vein and 10.0m @ 43.4 g/t gold on a footwall vein (Figure 2, Table 1). This high-grade mineralisation is open along strike in both directions over one kilometre with 200 metres of vertical extent which is open for a further 100 – 200 metres up-dip (Figure 2). In 2019, the Company expects to complete a further 14,500 metres of resource definition drilling and further drill other major veins on the prospect. 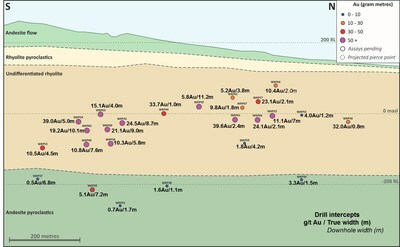 All drill data in relation to the Waihi exploration results can be found on the Company's website at http://www.oceanagold.com/investor-centre/filings/. In line with ASX listing requirements, OceanaGold has appended the information required by JORC Table 1 for Waihi exploration results to its ASX announcement. JORC Table 1 is not required under National Instrument 43-101. Readers are referred to the ASX website at www.asx.com.au or the OceanaGold website at www.oceanagold.com to view JORC Table 1. In 2018, the Company produced 533.3k ounces of gold and 15.0k tonnes of copper with All-In Sustaining Costs of $767 per ounce on gold sales of 532.7k ounces and copper sales of 14.5k tonnes. In 2019, the Company expects to produce between 500,000 to 550,000 ounces of gold and 14,000 to 15,000 tonnes of copper at All-In Sustaining Costs ranging between $850 and $900 per ounce sold. The resources and exploration results were prepared in accordance with the standards set out in the 2012 Edition of the 'Australasian Code for Reporting of Exploration Results, Mineral Resources and Ore Reserves' ("JORC Code") and in accordance with National Instrument 43-101 – Standards of Disclosure for Mineral Projects of the Canadian Securities Administrators ("NI 43-101"). The JORC Code is the accepted reporting standard for the Australian Stock Exchange Limited ("ASX"). 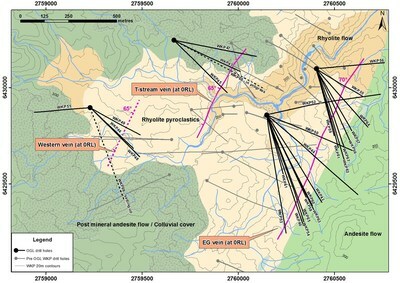 Information relating to Waihi exploration results in this document has been verified by, is based on and fairly represents information compiled by or prepared under the supervision of Lorrance Torckler, a Fellow of the Australasian Institute of Mining and Metallurgy and an employee of OceanaGold. Mr Torckler has sufficient experience that is relevant to the style of mineralisation and type of deposit under consideration and to the activity being undertaken to qualify as a Competent Person as defined in the JORC Code and is Qualified Persons for the purposes of the NI 43 101. Mr Torckler consents to the inclusion in this public report of the matters based on their information in the form and context in which it appears. Certain information contained in this public release may be deemed "forward-looking" within the meaning of applicable securities laws. Forward-looking statements and information relate to future performance and reflect the Company's expectations regarding the generation of free cash flow, execution of business strategy, future growth, future production, estimated costs, results of operations, business prospects and opportunities of OceanaGold Corporation and its related subsidiaries. Any statements that express or involve discussions with respect to predictions, expectations, beliefs, plans, projections, objectives, assumptions or future events or performance (often, but not always, using words or phrases such as "expects" or "does not expect", "is expected", "anticipates" or "does not anticipate", "plans", "estimates" or "intends", or stating that certain actions, events or results "may", "could", "would", "might" or "will" be taken, occur or be achieved) are not statements of historical fact and may be forward-looking statements. Forward-looking statements are subject to a variety of risks and uncertainties which could cause actual events or results to differ materially from those expressed in the forward-looking statements and information. They include, among others, the accuracy of mineral reserve and resource estimates and related assumptions, inherent operating risks and those risk factors identified in the Company's most recent Annual Information Form prepared and filed with securities regulators which is available on SEDAR at www.sedar.com under the Company's name. There are no assurances the Company can fulfil forward-looking statements and information. Such forward-looking statements and information are only predictions based on current information available to management as of the date that such predictions are made; actual events or results may differ materially as a result of risks facing the Company, some of which are beyond the Company's control. Although the Company believes that any forward-looking statements and information contained in this press release is based on reasonable assumptions, readers cannot be assured that actual outcomes or results will be consistent with such statements. Accordingly, readers should not place undue reliance on forward-looking statements and information. The Company expressly disclaims any intention or obligation to update or revise any forward-looking statements and information, whether as a result of new information, events or otherwise, except as required by applicable securities laws. The information contained in this release is not investment or financial product advice.